The Model JR42 was swung by one of baseball's great Hall of Famers, Jackie Robinson, and is the ultimate old school bat. The very thick 1 1/4" handle transitions to a slim 2 1/2" barrel giving the JR42 exceptional balance. This is a great choice for the player looking for hard wood, lots of pop and good bat control. Though popular in the 1950s and 1960s, it’s become favored again with many big leaguers in the 21st century who like the large mass the heavy bat puts behind the ball plus the bat control the thick handle provides. The JR42 is a fantastic bat. I have been using them for 5 years and have only broken three of them. The large handle provides excellent control as I find I can make small corrections in mid-swing. This makes it much easier to foul off 2 strike pitches and to hit the outside pitch to the opposite field. This bat is a dream to bunt with. 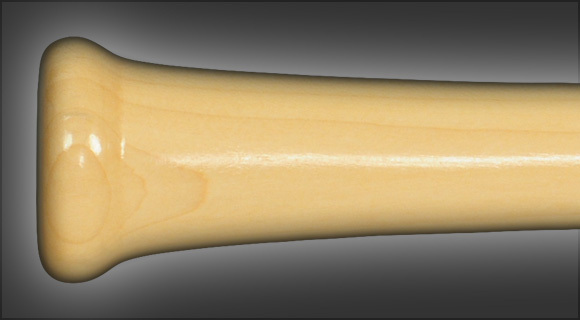 The fat handle ensures you have a decent amount of wood on the ball even when you get jammed inside. This balance of this bat is such that it feels much lighter than it is, likely because the center of mass is closer to your hands than with thin handle bats. It has excellent pop. 167 1 The JR42 is a fantastic bat. I have been using them for 5 years and have only broken three of them. The large handle provides excellent control as I find I can make small corrections in mid-swing. This makes it much easier to foul off 2 strike pitches and to hit the outside pitch to the opposite field. This bat is a dream to bunt with. The fat handle ensures you have a decent amount of wood on the ball even when you get jammed inside. This balance of this bat is such that it feels much lighter than it is, likely because the center of mass is closer to your hands than with thin handle bats. It has excellent pop. Bat arrived in a week vs. the 3-4 weeks stated on website; maybe I got lucky. Craftsmanship is top notch. Bat hits solid, no sting. Well balanced model. Awesome model. Not for small hands...just saying. 159 1 Bat arrived in a week vs. the 3-4 weeks stated on website; maybe I got lucky. Craftsmanship is top notch. Bat hits solid, no sting. Well balanced model. Awesome model. Not for small hands...just saying. Comfortable handle, easier on the hands than my prior models, balance and bat control are superior. 152 1 Comfortable handle, easier on the hands than my prior models, balance and bat control are superior. I purchased the 34" JR42 for my 15 yr old son,he is 6' , 220lbs.I can't believe how much he LOVES it.The thick handle works well with his long long fingers,he's hit 2 doubles the 2 times he's used it.He carried it around all day when it arrived,swinging it and putting it over his shoulder,then took out his metal bats and put this in his bag.He said it doesn't feel any heavier than his old bats so that was a releif.I got the MLB specs so there's no issue with bat rules and it arrived in Australia in about 10 days choosing the sped up order.I definantly will get him another asap so he has the 2 for Summer comp.My venture to find the best bat for him stopped here,to me that's a big deal. 47 1 I purchased the 34" JR42 for my 15 yr old son,he is 6' , 220lbs.I can't believe how much he LOVES it.The thick handle works well with his long long fingers,he's hit 2 doubles the 2 times he's used it.He carried it around all day when it arrived,swinging it and putting it over his shoulder,then took out his metal bats and put this in his bag.He said it doesn't feel any heavier than his old bats so that was a releif.I got the MLB specs so there's no issue with bat rules and it arrived in Australia in about 10 days choosing the sped up order.I definantly will get him another asap so he has the 2 for Summer comp.My venture to find the best bat for him stopped here,to me that's a big deal.